SIZZLER Annerley will serve its last cheese bread next month, as the fast food chain closes the doors to another of its much-loved restaurants. It follows the decision to close another Brisbane Sizzler at Brookside earlier this year just months after the chain's owners, Collins Foods, announced its Toowong restaurant would close. Customers have only weeks to enjoy the Annerley site, with staff being told the last day of trading will now be Sunday, July 2. In a statement to The Courier-Mail, Collins Foods said it had "reviewed the best use of its Annerley restaurant as part of the company's long term business planning" and decided to close the restaurant to re-purpose the site. "Details of the future use will be released at a later date," a spokeswoman for the company said. "The company is investigating other potential employment opportunities within its network for the Sizzler Annerley staff, including with its KFC and Snag Stand brands. "We thank them and also our Annerley customers for their support over the last 31 years. We look forward to welcoming our Annerley customers to our other Sizzler restaurants." Annerley was one of the first Sizzler locations in Australia. But despite a surge of 90s nostalgia for the fast food chain, Collins Foods has battled to keep the brand profitable. 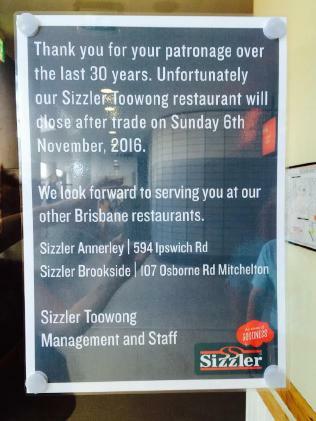 Sizzlers have been closing in Brisbane in the last few years. Although it insists Sizzler is not exiting Australia, it has admitted it is no longer investing in the group. University of Melbourne trends expert Dr Lauren Rosewarne said Australians had become "almost religious" about where they eat but the reason Sizzler had fallen out of favour was simple. "We've become passionate - if not even evangelical - about provenance of ingredients and the cult-like status of celebrity culinary figures. 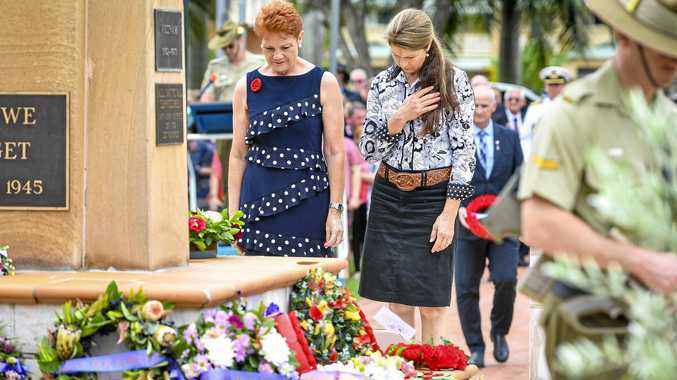 Places like Sizzler have a diminishing role in such a landscape," she told news.com.au in April. We wanted more excitement with our dinner, she said, and craved new initiatives like pop up restaurants and food trucks. Francis Loughran, Managing Director of food consultancy firm Future Food, said Sizzler was a brand of its time and stuck in the past. "Sizzler created friendly family restaurants that represented value for money, great service and easy parking. "But the market changed and the customers who visit Sizzler is shrinking." Mr Loughran said the family dining market was now far more competitive, with options unheard of in Sizzler's heyday. Gourmet burgers, spicy Vietnamese, posh schnitzels, healthy choices, pub food and even supermarket grab-and-go meals were all tempting people away. Sizzler had become boring, he said, with customers suffering from never changing 'menu fatigue'. But perhaps the main reason Sizzler Australia is because Collins' has bigger fish - or rather chicken - to fry. Collins' is one of KFC's key Australian franchises, owning hundreds of outlets. The firm's most recent half-year results show its KFC stores booking revenue of $250 million, with earnings up to $34 million. It's profit margin was a healthy 17 per cent. In contrast, revenue at Sizzler was down 11 per cent on the previous half with earnings of just $2.7 million. Profit margins were far slimmer than KFC, at just 8.6 per cent. In 2015, the company wrote down the value of Sizzler by $37.5 million. In its November investor presentation, Collins Foods was keen to point out that earnings were up at the chain and Australian sales were "better than expected". The company told news.com.au in April that while it had closed a "small number" of stores this year as leases ran out, "each closure was based on an independent assessment of that restaurant's performance and the ongoing suitability of the location." "Collins Foods Limited remains committed to the Sizzler brand and has no plans to close the Sizzler chain," the company said. It was "actively supporting" the remaining stores and staff "who work hard to provide a fabulous and unique experience". A development application for the Annerley site has been lodged with Brisbane City Council.